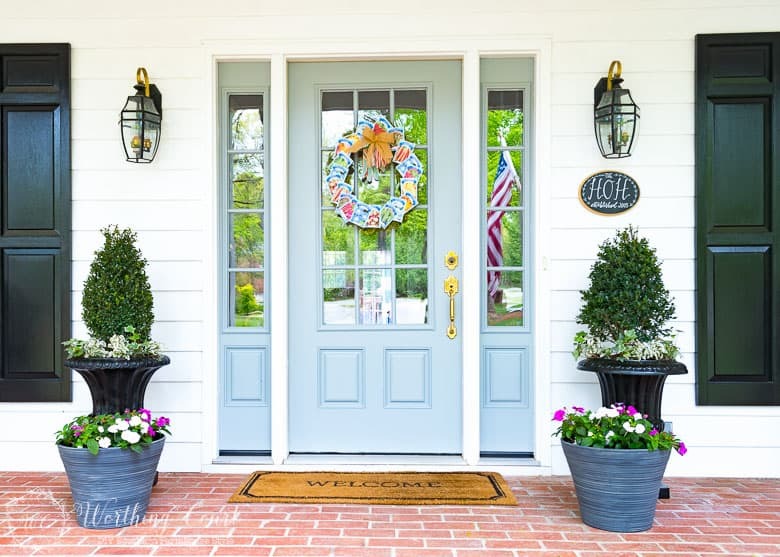 For last week’s edition of The Best Of Worthing Court I shared my new front door and last year’s spring entry with you. Anytime that I share my new front door, I gets loads of comments about the adorable seed packet wreath that I have displayed on it during the spring and summer. That wreath was such a fun, easy and inexpensive project to do! I might have giggled to myself a little when I was putting it together. 😀 I think it would make a great house warming gift, Mother’s Day gift or a gift for any occasion. 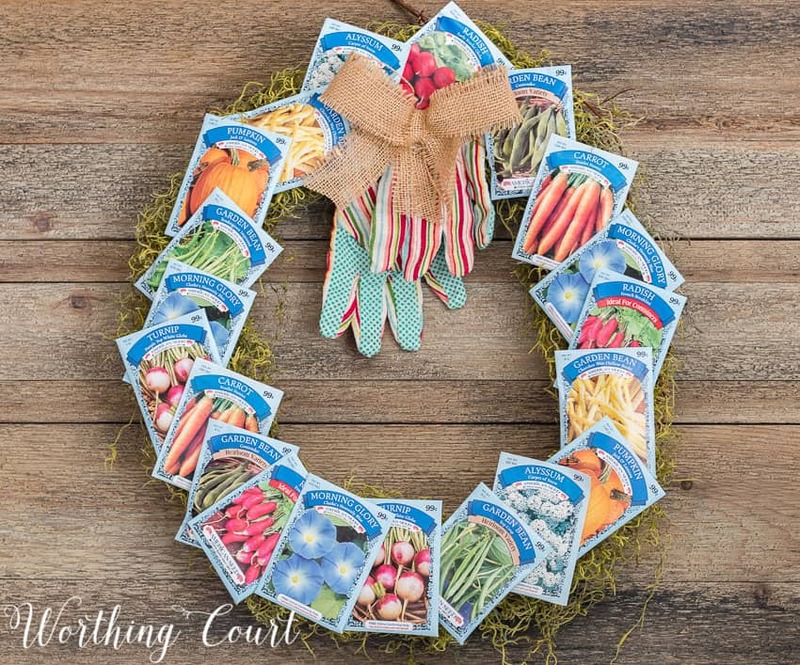 For this week’s edition of The Best Of Worthing Court, let’s take another look at the wreath and let me show you exactly how I made it! Keep in mind – it could be made with vegetable or flower seed packets and could be customized to any color(s) that you want to focus on. This cute thing was a breeze to put together and took me less than 15 minutes. Let me show you how you can make one too. 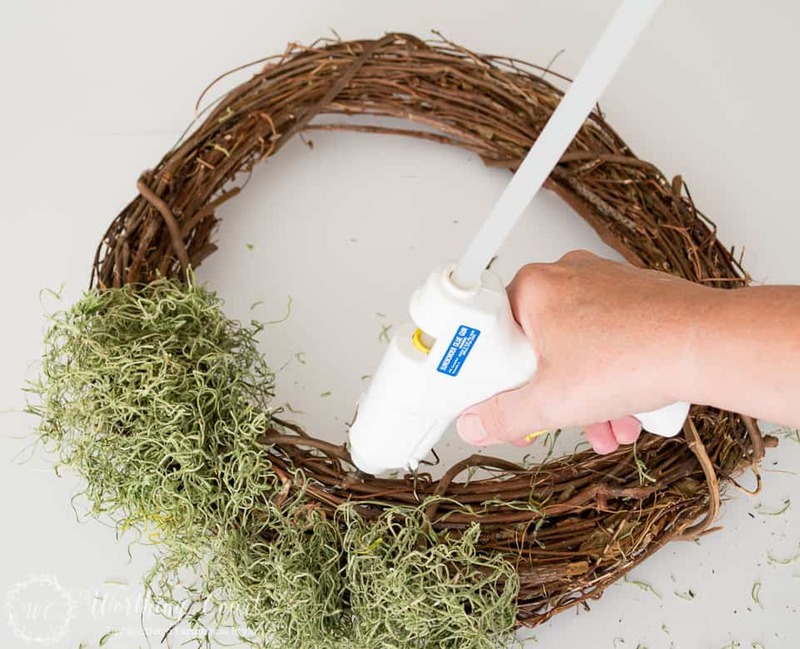 Attach the Spanish moss to the wreath with hot glue, by randomly placing gobs of glue on the wreath and pressing the moss into it. Be careful not to press your fingers into the hot glue. 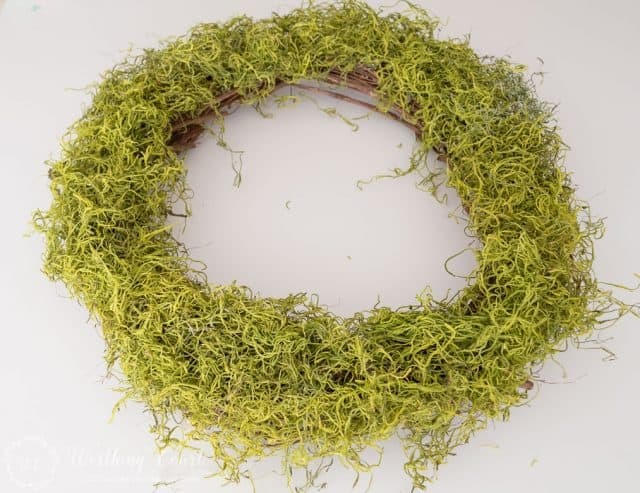 This is what the wreath should look like once all of the moss has been attached. Hot glue the seed packets to the top of the moss, by placing a generous sized dollop of glue on the back of each seed packet. Press into place. Arrange the seed packets at different angles for interest. Attach the gloves to the wreath using hot glue. I folded one glove in half and turned the other glove around so that you could see the palm side of it. Before attaching the gloves to the wreath, I attached them to each other with a blob of hot glue. 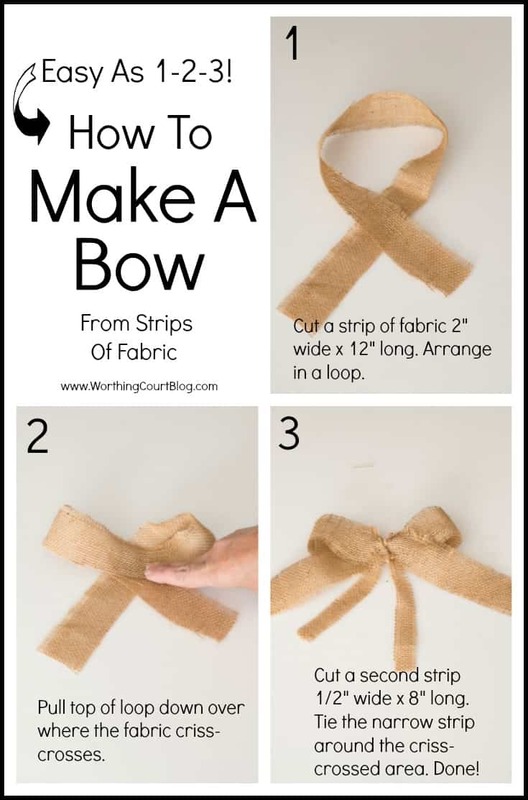 Make a burlap bow using strips of fabric or burlap ribbon. Hot glue the ribbon toward the top of where the gloves are attached. Directions for making an easy bow are below. Here’s an easy, easy method for making your own bows. Hang your wreath and enjoy! Think I’ll fool my guests into believing that I’m a master gardener with a green thumb? I sort of doubt it. *is* darling! Not isn’t! Stupid autocorrect lol! Looks great on your front door! I love easy and inexpensive!! What a fun project to make with my daughters! Love this idea. I would hang mine on my shed’s door and keep it up all through summer! But, if you come up with another cool idea for the summer, I’d change it!!! Thanks for this idea! Love the wreath. It just looks like spring. Your wreath is so cute and is perfect for spring decor. I like how you added the garden gloves under the bow. I’m wanting to make one for my house now! Perfect for my friend’s birthday. She is going to love it. I am off to create. Thanks for sharing. Enjoy your day. Your wreath looks springy on your front door. 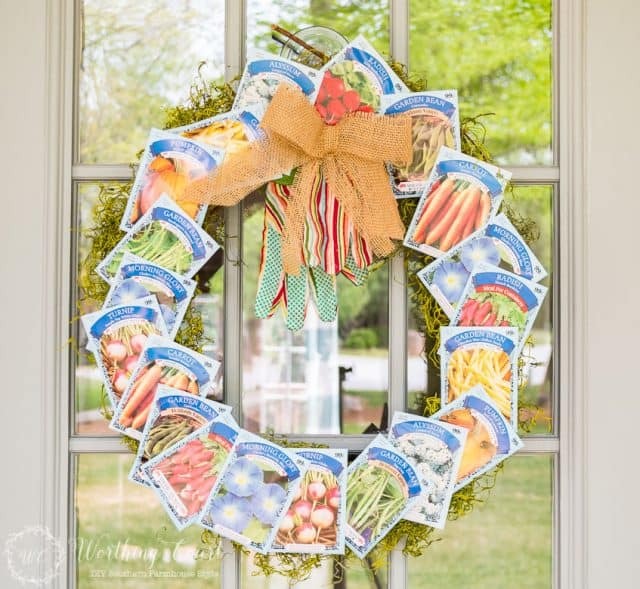 Glad to see spring come to North Carolina…well not quite there in Waynesville but we are having some warmer days and soon I will be able to use my outside décor like your seed packet wreath…so cute !! For those of us who don’t have a covered porch, but want to use cute ideas like this, I have a suggestion. In my case, people routinely enter through the garage into my kitchen. I decided years ago that that was the place that needed a decoration. This wreath will look perfect there where all my friends come in! 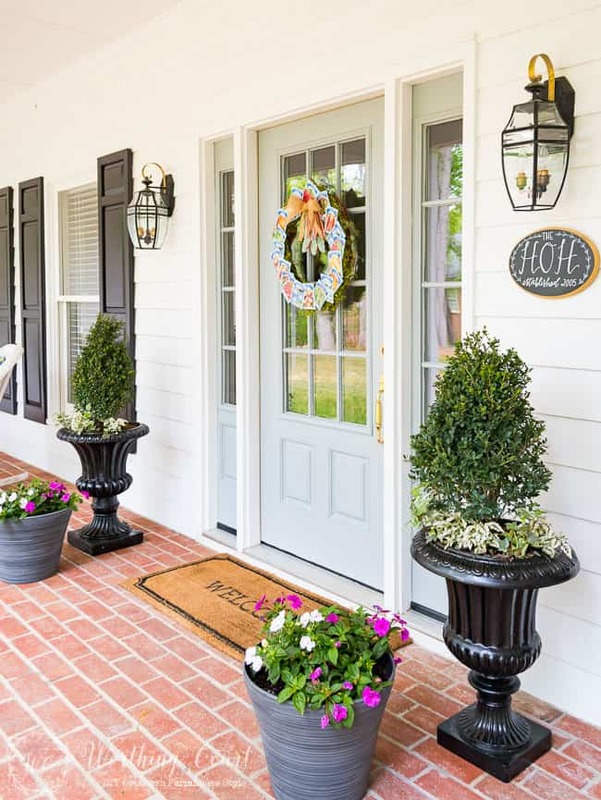 The wreath is so adorable, and your front porch is charming! Your wreath is very cute. I bought some flower seed packets. You gave me a brilliant idea. The wreath is lovely and unique. Thank You for sharing. Cute ! Looks great on your door. Thank you for all of your ideas and inspiration. The wreath looks great against the door color! 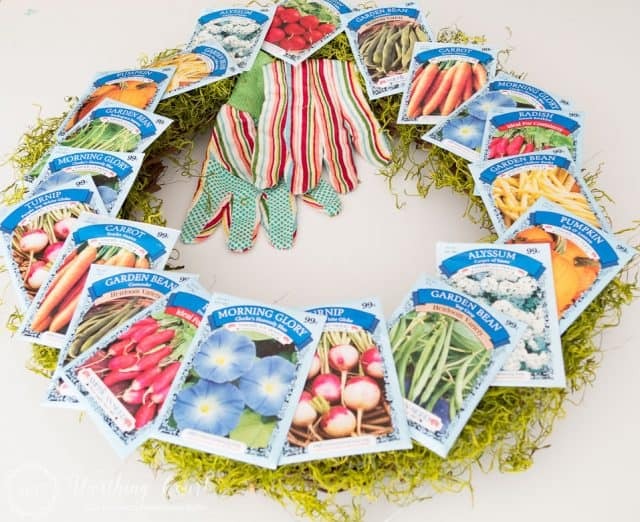 Went right out and got the supplies for your seed packet wreath and I love It! 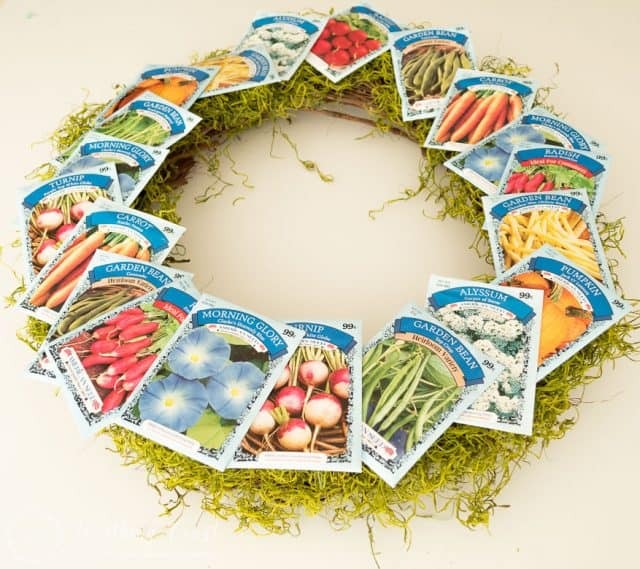 $4.99 for the wreath at AC Moore, seed packets ( the same ones!) 4/$1.00 at The Dollar Store; $1.00 for the gloves ( LOVE the Dollar Store! ); used leftover moss and burlap I had at home and VOILA! Easy Peezy Wreath – Thanks for the ideas! Thanks for the tutorial, Suzy. This would even be cute with 1/3 or 1/4 of the wreath covered with the packets, and the gloves/bow at the bottom/side. So much you can do with this idea! (Catching up on my blogs after vacation/sick). You can’t help but smile looking at this wreath! It is a perfect blend of creativity, cuteness and a wee touch of whimsey! It looks great at this door! I miss having a front door to decorate with a handmade wreath. Such an Adorable wreath! I plan to make one for my friends birthday as she loves to garden. Thanks for the Great Idea! This is on my “to do” list. I have purchased the seed packets and moss and have a pair of gloves and a grapevine wreath. This is very uplifting and colorful. 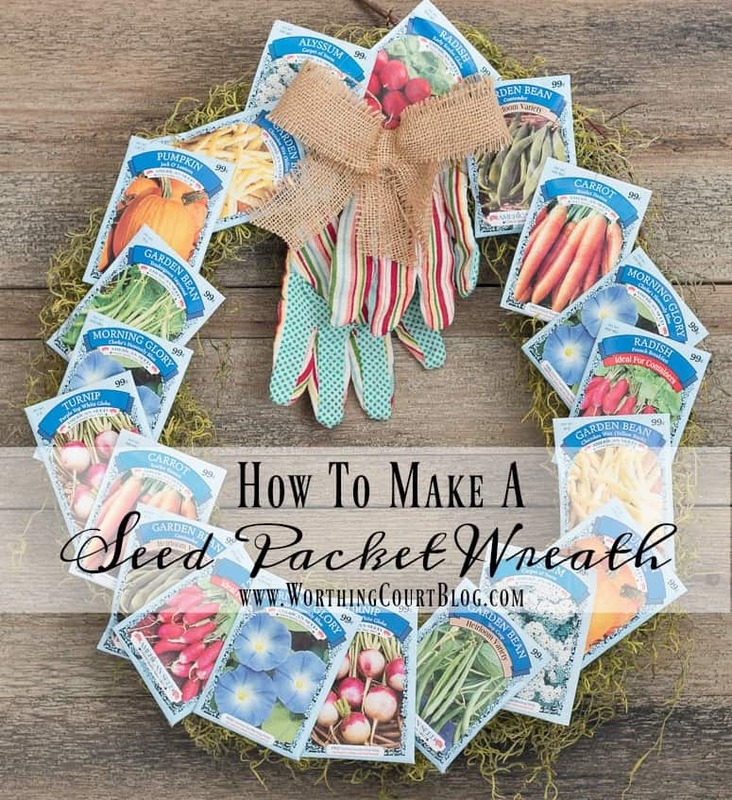 I’m going to laminate my seed packets and place the wreath on my garden gate. Thanks for sharing the complete instructions. Love the moss, too! Just seeing this in the spring of 2018 but it’s still a great idea! I’ve got several vintage seed packets…now to find a few more for a wreath. Thank you for the inspiration!